Why is it important to optimize app store screenshots, not just localize? Our testing ideas come out from the App Store design trends. We want to understand why our competitors and the top apps in general do what they do, is that efficient and why. We also try to use psychological patterns from the human behavioral studies in our visual design to engage users in interaction with our app. People react better, in a more positive way when they recognize familiar images, something they see every day. We clearly understand that the mentality differs a lot from country to country, especially for the Asian market. People have different values and lifestyle experiences. Thus, we should do our best to deliver the message in the way that will resonate with the audience and won’t seem strange. The screenshot optimization for different cultures is crucial. Because people react better, in a more positive way when they recognize familiar images, something they see every day. This process of recognition is called “processing fluency”. A brain tends to react faster on simple and accustomed images, generating a pleasant feeling, that in turn can convert into a download. What were initial results from screenshot optimization? This was our first localization experiment for our Magic Jigsaw Puzzles app. Before changing our screenshots in the App Store we had two tests in Splitmetrics to make sure that the change won’t affect our current conversion rate in a negative way. In the graphic below you can see how our conversion rate changed after we optimized our app product page for Japan. The change resulted in 36% conversion rate increase. And this is just a beginning as we are planning to make more tests for the Japanese region to understand its audience better and attract new users with the images they’d love to see. App A/B testing platforms such as SplitMetrics are a great option as it would take forever to test everything in the real environment. It’s also very risky because you may lose current advantages. What to remember when localizing app product pages? When optimizing your localized screenshots, the important part is to make sure that you also optimize your user acquisition interstitials accordingly. In fact, even after setting a winning screenshots set in the store, you may have a loss of conversions just because your unoptimized interstitials attract different audience. That was a mistake we made once and will never do again. The hardest part was trying to “copy” Japanese style. 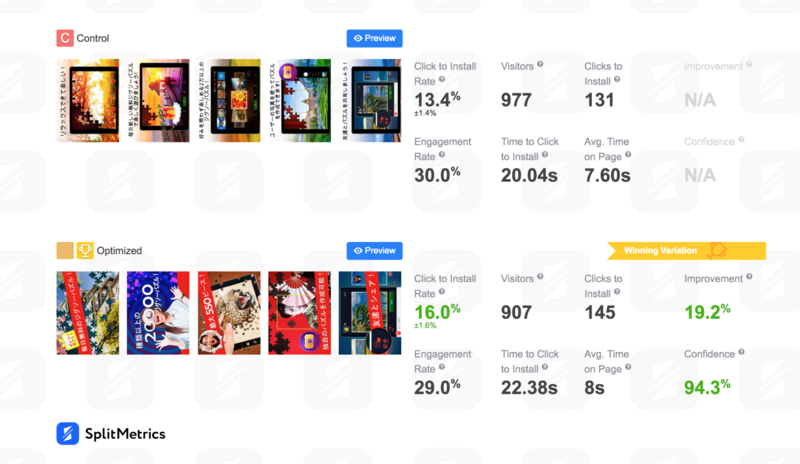 We made a lot of research on this, analyzed top Japanese apps, performance of all our Japanese interstitials for different games to find some iterative pattern. We found that native publishers in Japan often use lots of small elements in their promo, adding special effects and emotional captures all over the image. For our European eye it looks insane and the example with the processing fluency that I’ve mentioned above contradicts Japanese mentality. When designing the Japanese screenshots for one of our games, it felt like it was not “Japanese” enough, so we were adding more and more cultural elements. The designer said he had never done anything that crazy before. When you’re going for a new region, you should be ready to see ordinary things in a new manner. How to tap a winning variation? We’ve noticed that if our new screenshots set wins a test with a little advantage (around 1% difference in the conversion rate), that wouldn’t guarantee the gain of conversion in the real environment. It may even result in the convesion rate decrease sometimes. Before noticing it, we were surprised that we hadn’t seen any positive changes. So make sure that your winning set overcomes the control one by at least 2% to get the real visible benefits. Tapping variations that finally give higher conversions becomes easier with every new A/B experiment. You analyze mistakes, A/B test and repeat. Keep going until you have the results you are satisfied with. 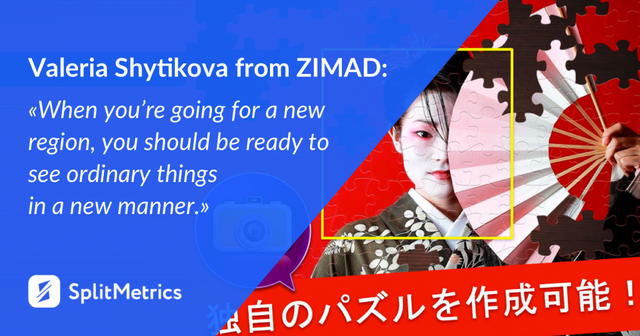 What are the key takeaways and what about Zimad’s future plans? As they say “There is no limit to perfection”, but everyone strives for it, so do we. We have a lot of interesting and unexpected ideas that we’d like to test, and we’d love to surprise our potential users in a good way. I think it’s time to be more creative, because people are tired seeing the same screenshots and icons over and over again.